Topic: How are these two different? So I have the left one...but wondered if the right one is different enough to get it. Did Jochum's style differ much or did he have the same ideas to bring to two different orchestras? That meaning if he played with one orchestra, expect the same thing with another. Or is that wrong thinking? Do these have enough differences, or did Jochum sound the same on both? Re: How are these two different? The first is generally considered to have more interpretative liberties, the second more strict and staid in its conception. Both are well played and worth hearing. They are very similar, IMO. There are subtle differences from one to the next but the same revisions in both. Go for the best price you can find. Be sure to compliment your cycle with Giulini's 8th with the VPO. I spent my lunch hour today completely enthralled by the Adagio... I had to listen twice. It is such an expansive interpretation and the Vienna strings just sing... perfect. The Guilini 9th is great too. Plus, I think the EMI release with the Dresden should be cheaper. At least it was when I bought it. So I have the left one...but wondered if the right one is different enough to get it. If you have one you don't really need the other. One is more earthbound than the other but I forget which. 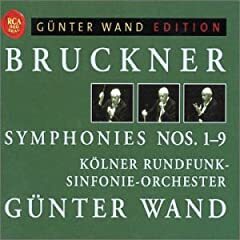 I vaguely remember those that find interesting things in this conductor's Bruckner preferring the DG. oh, I did not know that (that fact I mean AND the symphony) . That one I don't own...I bow to your superior knowledge. It's ... disappointing. The interpretation drags, the sonics are awful - even the playing is ragged in places. Not up to the standard of the others. E.g. the live Philharmonia #7 has never shifted from the top few steps of my personal pantheon. A friend of mine who was there on the night (Proms '82) said at the end the roof lifted off. 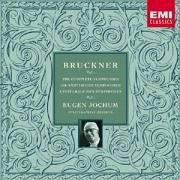 If you already have the Jochum set on DG, then (1) yes, the EMI Dresden set is different, but (2) not sufficiently different to make it worth buying if these are your only Bruckner recordings. 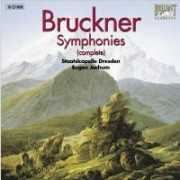 There is a wide range of Bruckner interpretation. If you're interested, you could sample something with a different savour. Sarge's suggestion of Celi's MPO set is a good one: it contains at least 2 outstanding performances (plus 1 or 2 others which may be more controversial) but all are well worth hearing - and the set is de rigeur for a serious Brucknerian. You can also try Karajan/BPO. This is a consistent and competent set, representing (again) a different approach, which a lot of people find convincing. For a consistent middle of the road set in good sound, I would rather get Wand, Haitink or Barenboim, the latter two of which are inexpensive these days. Karajan has very odd balances. A lot of detail gets lost in his wall of sound. Or for even better sound, get Chailly. But he does have at least one dud in his set (like that lifeless 9th). It may be better to pick and choose some of Karajan's (he recorded the 8th at least four times) recordings of the later symphonies. His '88 8th is lovely... and makes a great addition if you're carrying more Nowak (Celibidache, Jochum, Giulini, Tintner--1887 ed. vs. 1890 on the Tintner so more like a third edition entirely--etc.) than Haas editions among your current readings. One of these days, I'm going to add the Wand cycle to the Jochum and Tintner sets I already own, but there are so many other composers and individual works that I should devote more attention to, it's likely to be some time before I do that. I second your recommendation 100%. I have Wand's 4th...and well let's just say the Romantic symphony can't get much better than that.